We're happy to announce that the European VAT Number Validation API has now been integrated into the vatlayer API. 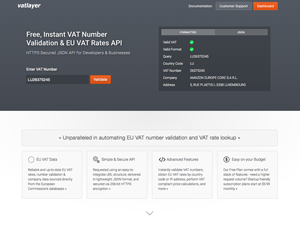 This page was created to introduce the vatlayer API, a free JSON-based REST API for instant VAT number validation, retrieving all or single EU VAT rates based on IP address or country code, converting prices in compliance with EU VAT rates and types, and more. Don't have an API access key yet? Sign up here - it's free! "company_address": "5, RUE PLAETIS L-2338 LUXEMBOURG"